[CONT](VC):During your turn, this unit gets [Power]+1000 for each «Dark Irregulars» in your soul. 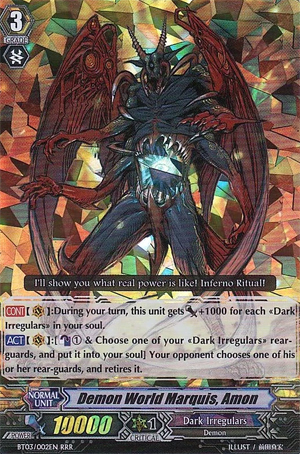 [ACT](VC):[Counter Blast (1) & Choose one of your «Dark Irregulars» rear-guards, and put it into your soul] Your opponent chooses one of his or her rear-guards, and retires it. Serves no modern purpose except as a Legion partner to Astaroth, and you only ride Astaroth if you couldn't ride that new unit Agares. At least he can retire things.